For the first time ever, millions of action sports fans will see the UFC and their event numbers racing around the ESPN X Games this weekend, as the UFC continues their aggressive cross-promotional partnership with PMR Motorsports. X Games fanatics packed inside the LA Coliseum won’t miss the trademark UFC logo and numbers “117” and “118” on the 2007 Subaru Impreza WRX STI Rally Cars driven by Patrick Moro and Timothy Rooney of PMR Motorsports. 117 and 118 symbolize the next two blockbuster UFC events coming up in August. 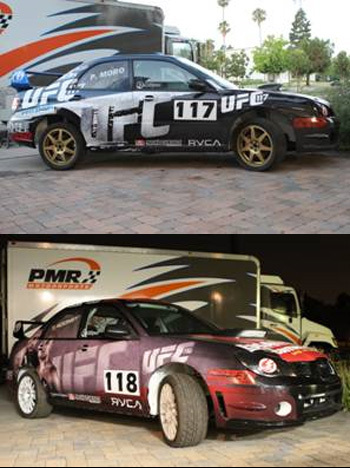 “The UFC and the XGames are the perfect combination, and it’s an honor for UFC 117 and UFC 118 to be represented on the PMR Motorsports rally cars,” said UFC President Dana White. UFC 117 takes place August 7th from the Oracle Arena in Oakland, CA. The card features a middleweight title scrap between champion Anderson Silva and the chatty Chael Sonnen. Silva was in attendance Thursday night for the Moto X Freestyle Final, Women’s Super X Final and Men’s Super X Final. UFC 118 will showcase the highly anticipated rematch between reigning champion Frankie Edgar and former king BJ Penn. That August 28th event takes place inside TD Garden in Boston. Fans can catch the live Rally Car Racing and SuperRally action live on ESPN, Saturday, July 31st.